Home Posts Tagged "factory farms"
Who Declared War on ALL of Iowa? 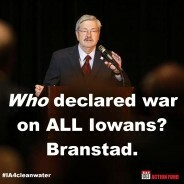 Branstad. 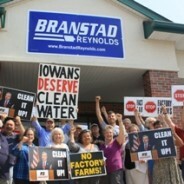 Iowa Citizens for Community Improvement Action Fund filed a legal complaint in federal district court August 20 alleging that an August 19 vote on new Clean Water Act rules by the Environmental Protection Commission was illegal because five members of the EPC appointed by Governor Terry Branstad have a direct financial stake in the factory farm industry and should have recused themselves from the vote because they would financially benefit from passing a weak rule.